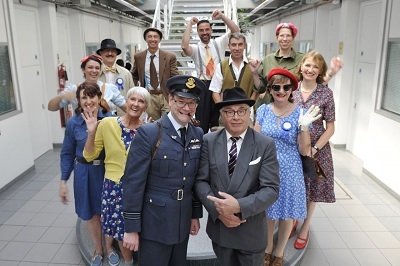 A 1940s-style street party helped friends and staff of Cardiff Medicentre celebrate the 70th birthday of the NHS in style. The Rock Choir sang a string of more modern hits to get the party underway, from ‘Don’t Stop Me Now’ to ‘Shut Up and Dance’ as staff from Cardiff and Vale University Health Board joined the festivities. The Medicentre – Cardiff’s incubator for medtech start-ups next to the University Hospital of Wales – threw its doors open in the summer sunshine. NHS at 70 speeches came from Maria Battle, Chair of Cardiff and Vale University Health Board, and Professor Keith Harding, Dean of Clinical Innovation at Cardiff University School of Medicine. Maria Battle, Chair of Cardiff and Vale UHB said: “It was wonderful to see so many people come together to celebrate the NHS at 70, from patients, staff, visitors and invited guests, who all took part in many of the events held throughout the Health Board.